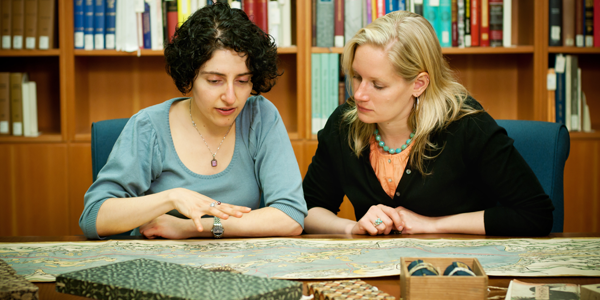 Staff members Shirin Eshghi and Katherine Kalsbeek are part of the Managing at UBC program. A program to support managers at UBC Library is one of the key initiatives stemming from efforts to bolster UBC Library’s workplace culture. In November 2011, UBC staff were given the opportunity to share their thoughts on working at UBC, via a Workplace Experiences Survey conducted by Ipsos Reid. Library staff participated by sharing their views and opinions on topics such as equity, career navigation, senior leadership communication and action, and faculty orientation. Library-specific results were shared with staff in March 2012. Soon after, the Library established an Exceptional Workplace Committee, which has focused on the creation of a variety of programs, projects and initiatives to contribute to the development of an exceptional workplace at the Library. A Library cohort of 50 staff with supervisory responsibilities are working with UBC Human Resources over a 12-month period to develop their leadership and management abilities through coaching, online lessons and face-to-face events. The program has been tailored specifically for the Library and allows for the participation of faculty, CUPE 2950 and Management and Professional staff.